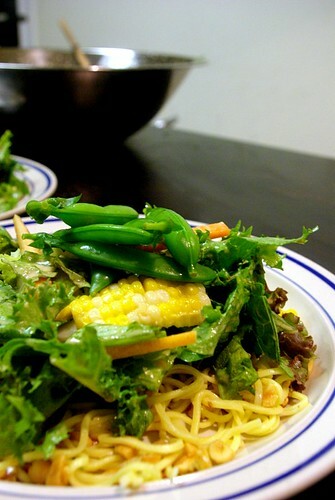 farm fresh salad with ginger-tahini dressing over a bed of seasoned egg noodles, originally uploaded by aarn! +29th June, 2009+. chopped up and washed a handful of fresh greens from the parker farm CSA: romaine and red leaf lettuce, and chicory. boiled an ear of corn, sliced kernels from the cob and chilled. added to the greens julienned young carrots and thin halved rounds of asian turnips (white lady). grated 1.5t. fresh ginger into a bowl. added to it, 1 clove of crushed garlic, a pinch of cinnamon and salt, 1.5T. seasoned rice vinegar, 1T. soy sauce, 1t. spicy dijon mustard, 1t. sriracha chili sauce (more to taste, later), and 2-4T. smooth tahini, then slowly mixed in canola oil until the desired consistency and taste. garnished with blanched and chilled sugar snap peas (steve parker's famous), and served over a bed of chilled egg noodles which had been tossed in sesame oil and coated in crushed peanuts.